Monday, June 4 2018 at Juday Creek Golf Course! Singles, Doubles and Threesomes Welcome. B100 will match you up in a foursome. 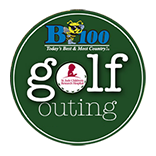 Registration includes golf, cart, lunch buffet and 4-per person prepacked coolers! Payment will be taken online via Paypal/Credit Card online after registering.